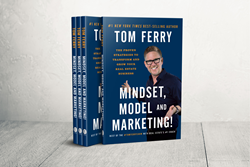 “Mindset, Model and Marketing!” makes Ferry a two-time best-selling author. It’s all about empowering agents to fulfill their greatness. Tom Ferry, the No. 1 ranked real estate coach worldwide, is now a two-time Best-Selling author. His brand-new book, "Mindset, Model and Marketing!" earned best-seller status as well as #1 New Release by Amazon. The book codifies leading-edge tips and business strategies from Tom Ferry’s popular YouTube series, the #TomFerryShow, into 153 pages of powerful business-building advice. The title refers to three disciplines essential to business success — developing a winning MINDSET, following the MODEL of other successful professionals in the marketplace, and proven MARKETING strategies today’s top real estate professionals are using to separate themselves from the pack. Proceeds from “Mindset, Model and Marketing!” will benefit breast cancer research. Kathy Ferry, Tom’s wife, recently won her battle with the disease and is proud to be a breast cancer survivor and activist today. Tom Ferry’s first foray into penning a book, "Life! By Design," was a 2010 New York Times Best-Seller. The weekly #TomFerryShow has amassed more than six million views on YouTube, spanning in excess of 130 episodes and is available via video, podcast, blog summary and now on paperback and Kindle. "Mindset, Model and Marketing!" is available now both in paperback and digitally through the Amazon Kindle Store. As a leading real estate coach for nearly 30 years, Ferry is a well-known public speaker and business coach, providing real-world, hands-on training to real estate professionals worldwide. His seminars and events attract thousands of success-minded industry professionals annually. His Irvine, CA-based company, Tom Ferry International, employs more than 150 business coaches and a total staff of more than 300 employees.